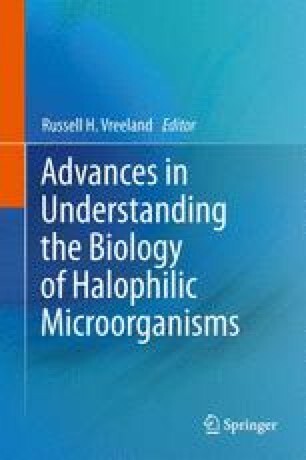 Approaches Toward the Study of Halophilic Microorganisms in Their Natural Environments: Who Are They and What Are They Doing? Hypersaline lakes with salt concentrations exceeding 250 g/l are often characterized by very dense communities of halophilic microorganisms imparting a red coloration to the brines. Such red waters can be found in the North Arm of Great Salt Lake , Utah, in crystallizer ponds of solar salterns for the production of salt from seawater, and in many extremely hypersaline alkaline lakes. At times even the magnesium chloride-rich waters of the Dead Sea have become red as a result of massive development of pigmented salt-loving microorganisms. Dedicated to the memory of Carol D. Litchfield (1936–2012) who taught me much about halophiles.